Using programmable digital thermostats save money. I can’t stress enough how making an investment in programmable digital thermostats can really pay off with your heating and cooling bills and save you money. In addition to saving you money digital thermostats also help make your house more comfortable by controlling the temperatures based on your schedule. You can buy the Honeywell Focus Pro 6000 from Amazon for $63.39. This programmable digital thermostat allows you to create a schedule for the 5 days of the week plus a schedule for Saturday and Sunday individually. 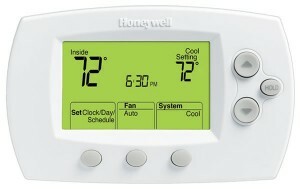 I’ve found Honeywell thermostats to be very reliable and easy to program. I’ve used several different models that they sell but this is the one I prefer. I’ve used digital programmable thermostats in several houses that we’ve lived in with different heating systems. The digital programmable thermostat works great with forced hot air, baseboard hot water and even with radiant heat. Our new home has a combination of high velocity air conditioning, baseboard hot water and radiant heat. This thermostat works great with all our systems and it’s certainly made a big difference in our energy consumption. The key to saving money with a digital thermostat is to program your thermostat to lower the heating or cooling need when you’re away from home or sleeping. I like to set back the temperature by at least 10 degrees when we are away at work and school or sleeping. I’ve found that this method has saved us over 20% typically on our heating and cooling bills. Installing a digital programmable thermostat is really easy. If you’re interested in learning more about how to do it then check out my post on Installing Programmable Thermostats. With winter just around the corner this is a great time to buy a programmable thermostat and cut back on your energy this year and save some money. I suggest you check out the large selection of programmable thermostats at Amazon. They have a great selection at hard to beat prices. I recommend the Honeywell Focus Pro 6000 because it’s worked very well for me! Thanks for spreading the word on programmable thermostats. Perfect timing as we recently did a HowTo for installing them and are also doing a Giveaway this week. With such a low expense and easy install it’s a no-brainer upgrade to as you said save money and energy in your home. My husband and I have been debating if we should get a programmable thermostat. The reason is that I’m staying home mom, and my daily schedule are not every day. My thought is once we programmed based on my typical daily routine, I will probably easily forget to turn it off when I go out (I’m usually good at remembering turning off the heat before I leave). Not sure if we can really benefit from using this system. Bonzgirl – You can definitely take advantage and here’s how. Every night after you’ve gone to sleep a programmable thermostat can turn the heat down 5 to 10 degrees and really save some money. Most of these thermostats have four settings, roughly; morning, afternoon, evening and night. So you get to decide what temperatures. I say go for it, you’ll be surprised at how well they work. I didn’t know you can program it for 4 setting. So, can I just set the temperature to go down to 60F at 11pm, regardless the heater is on or not at the time? I’ve always thought I have to set up when it turns ON, and then when it turns OFF, as a set. In this situation it only turns down between 11 pm and 6 am. Most of the programmable thermostats also allow for a different set of settings for Saturday and Sunday. One set for M-F and one set for S & S.